Business services connect with external systems and receive messages from them. Business services relay the messages to other business hosts in the production. Business processes allow you to define business logic, including routing and message transformation. Business processes receive messages from other business hosts in the production and either process the requests or forward them to other business hosts. Business operations connect with external systems and send the messages to them. Business operations receive messages from other business hosts in the production and typically send them to external systems. The following figure provides a conceptual overview of a production and business hosts. Business hosts communicate with each other via messages. All messages are stored in the InterSystems IRIS™ database and can be seen via the Management Portal. In most cases (but not all), a business service has an associated inbound adapter. The role of an inbound adapter is to accept input from entities external to the production. Similarly, a business operation usually has an associated outbound adapter. 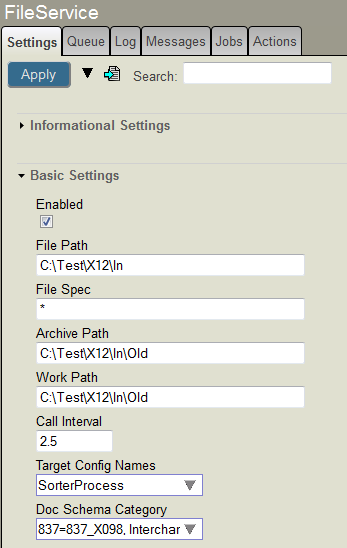 The role of an outbound adapter is to send output to entities external to the production. InterSystems IRIS provides a large set of adapters to handle different technologies. For example, you use a different adapter for files than you do for FTP. It is also possible to define your own adapters. This view shows all the connections to and from one business host, Demo.Loan.FindRateDecisionProcessBPL. Note that this view does not display adapters because these are incorporated into the business service and business operation definitions. The TCP port on which a business service should listen. The production and its business hosts have settings provided by InterSystems IRIS; they correspond to properties of the production and business host classes. You can define additional settings in exactly the same way, by defining your own subclasses of InterSystems IRIS classes. You can also remove settings so that the corresponding properties are hardcoded and not configurable. An inbound adapter receives an incoming event, transforms it into a message object, and passes it to its associated business service. The business service creates a follow-on request message, and passes this new message to a business process or business operation within the production. A business process that receives a request message executes a predefined set of activities, in sequence or in parallel. These activities may include sending follow-on messages to other business hosts. 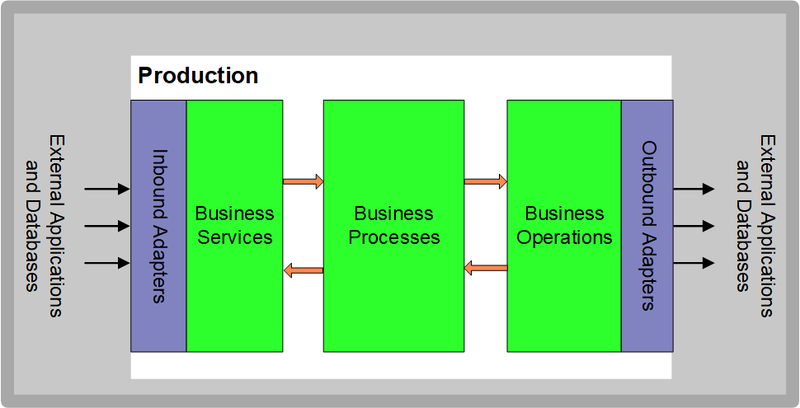 Business processes are also responsible for most or all of the business logic in the production. The next chapter provides more detail. A business operation encapsulates the capabilities of a resource outside InterSystems IRIS, usually an external software application. The business operation transforms properties of the request message object into a format usable by the external application API. An outbound adapter manages the details of communicating with a specific external system or application from within the production. It transmits the API call to the external entity. The response from the external system or application can trigger a cascade of response messages back to the external entity that started the flow of events. Details depend on the design choices made by the production developers. The processing can also include workflow, which makes it possible to incorporate human interaction into automated business processes. Uses of workflow within the enterprise might include order entry, order fulfillment, contract approval, or help desk activities. The chapter “Other Production Options” provides more information.